Wet places like the tiled floors of baths can develop dark spots, while stains on laminated floors are common enough. Forceful steam can be used to clear these quickly and naturally and without less hard soaping and scrubbing. Steaming with the Dupray Tosca Steam Cleaner works well on hard surfaces such as tile, slate, stone, glass, and ceramic. it is also good for removing the dirt and discolorations that can appear on laminate flooring and furniture over time. With this technique, you can maintain busy zones without any need for vacuuming or toxic detergents. Steam cleaning machines are made to boil water and then stream the resulting vapors onto trouble spots via output hoses. Parents like the method for the ability it gives them to clean and sanitize bathrooms and kitchens in a child-safe manner. The Dupray Tosca Steam Cleaner is a low-profile machine that can be wheeled around the house or shop to refresh hard flooring and counters, fixtures, furniture, and home or auto upholstery. With its powerful and easy-to-use features, you can apply the natural cleaning action of steam wherever needed. Product Description: Finally a commercial-grade steam cleaner for home or professional use. With its vibrant digital interface and new features that take full advantage of the technology inside, the Dupray Tosca can turns regular tap water into a powerful sanitation tool. COMMERCIAL-GRADE: suitable for home or work. PREMIUM ACCESSORIES: 25-piece kit, MADE IN ITALY. DIGITAL DISPLAY with active temperature, pressure and maintenance reminder. Warranty: 3 years on parts, Lifetime on stainless steel boiler. Expensive – but you get what you pay for! Gentle steaming works well on lightly-colored walls and can also be good for clearing murky areas such as shower stalls, kitchen counters, and the insides of appliances. Heavier steam may have to be applied in order to tackle encrusted and greasy gunk, but a light spray is usually enough in most cases. Forceful hot vapors will displace stains and eliminate 99% of most germs on exposed surfaces. Hard-surfaced materials are easily and safely cleansed and disinfected by this technique, which is also very effective for eradicating bed bugs, dust mites, and other tiny pests. Laminated boards can be carefully steam cleaned with mop attachments that are designed for the task. The lesser moisture produced by this model’s ‘dry-steam’ mode will not readily harm such surfaces, unlike the ample amounts generated by specialized carpet steam cleaners and conventional wet mops. Such materials can endure the occasional spill, although too much wetness can be harmful over time to laminate cores. If you do get a commercial carpet cleaner, be aware that the very pressurized and wet flows normally generated by these machines can seep into the inner layers and cause damage. Steam is ideal for cleansing and sanitizing many other water-resistant items. The balance among temperature, pressure, moisture content is what makes it such an effective cleaning method. The low and rounded base weighs some 17 lbs., but it is easier to heft up and down stairs than many bigger canister designs. The steamer unit is mounted on casters and is easily rolled around the house or garage. The good design is complemented by sturdy build and a selection of helpful accessories will enable you to handle a wide range of tasks. The long length of the power cord combined with the extended hose together make it easier to reach every corner of a large room. Hose attachments are of robust build and with tough connections among parts. In use, water is pressurized at 5 times normal atmospheric pressure. This elevates the boiling point even as the contents are superheated into ‘dry-steam’ at temperatures up to 320ºF/160°C. Constructed of AISI 304-grade stainless steel, the boiler is TIG-welded to withstand 4 times its normal operating pressures. For long-term reliability, the encapsulated heating element expands and contracts with each cycle, which effectively prevents mineral deposits from building up. An electromagnetic float constantly oscillates to prevent these from clogging the water-level sensor. There is a convenient low-water indicator that shows when the tank is running dry. An integrated thermal sensor turns off the heat as soon as the unit is low on water, preventing overheating. There is also a blow-off valve function that adds to the unit’s many safety features. The 25-piece set of attachments comprise a hose with a grip, two hose extensions, rectangular, triangle, and window tools, steam lance, large and small nylon brushes, small stainless-steel and brass utility brushes, scraper/plunger, refill bottle, steel wool, microfiber cloth, and pads. On bigger jobs, you will be using up a mound of cleaning cloths, which you affix to the rectangular tool with the fasteners. Things work well with the supplied microfiber towels, but other fabric cloths can be used instead. Since only 5 cloths are supplied with the package, you will surely be ordering many more of the same with heavy usage. You can buy the official Dupray accessory kit which comes with additional scrubbing brushes, microfibers, and a carrying bag, or you can always buy cheap multi-packs of auto terry-cloth at big-box stores, which are less costly and perform just as nicely, anyway. Boiler parts can degrade in time as a result of problems with uneven manufacture, thus it is smart to rely on reputable brands that offer longer warranties. This unit delivers on its manufacturer’s promises with an ample 3-year warranty that includes lifetime coverage for the boiler. An advanced digital panel manages all powered functions and displays convenient indications. Steam status, operating temperatures, pressures, and maintenance reminders on the display’s broad face are easy to read. Only 10 minutes or less is needed to produce highly-pressurized stream after the boiler is initially switched on. This step is quicker than that of many large steam machines. Even better, 60-90 minutes of constant steaming is possible with a light touch on the pressure control. Ordinary tap water can be used and once the tank is filled up and the boiler switched on, the first batch of steam will be ready in some 8 minutes. A full load usually brings at least 60 minutes of continuous steam output, which can be extended with careful adjustments using the variable-pressure control. Homeowners with swathes of tile and glass to clean will come to rely on this machine. While steaming, the output pressure should be set to low as you wipe down bath glass partitions and mirrors, which quickly removes soap scum. It is best to begin on low setting before progressively increasing the flow, adapting the output pressure to conditions. The supplied corner tool with its microfiber padding works great for rubbing off cloth stains until they progressively fade away. Initially applying steam at medium or high pressure to dislodge dirt, followed by use of the dryer low setting, works well for clearing ceramic tiles. This technique effectively dries floors for a streak-free finish and you will not need to worry about sliding on wet tiles, either. Be aware that the steam produced is not completely dry. Much dampness still accompanies each blast, so it is always a good idea to first test the hot flowing vapors on materials that are not known to be water-resistant. Before each refill, you must switch the boiler off and let things cool off before opening the tank. You will then have to wait again for a newer batch of steam is generated. There is safety interlock that prevents the possibility of burns while switching attachments, for added peace of mind. The boiler still needs to drain after every 30 hours of operation, though. This need is signaled by a convenient indicator on the panel. This quick procedure is vital to maintaining performance over the years. 1600-Watt boiler generates superhot steam up to 316°F/160°C with only 5% moisture content. Low-profile base on casters weighs some 26 pounds with attached hose. Huge reservoir capacity of 4 liters/135 ounces allows more time for cleaning in place of refilling. Steam pressure control enables users to adjust the flow to suit conditions. Indicators for steam-ready, pressure and low-water level are great for checking operational status. Automatic thermal shut-off enables greater safety in routine use. Helpful attachments enable the unit to be configured for various jobs. Extended hose lets you reach into and around tight spaces and corners. Long 15-foot power cord lets you reach back to the farthest outlets in larger rooms. Generous 3-year warranty with lifetime coverage on the boiler provides great assurance. Many homeowners find dry-vapor steam to be safer for refreshing laminate flooring, wood furniture, and fabric items, i.e. “They were moist at first and then dry in under 5 minutes”. A few noted that the wetter output of less advanced steam cleaners can lead to problematic soaking. Numerous buyers found the steam-ready, pressure, and low-water indicators useful for managing jobs. Comments such as “yes, the Tosca is expensive, but it’s worth every penny” and “this product was built to last!” bear out the high-end qualities of this very pricey model. Dupray’s Tosca currently scores an average of nearly five stars in Amazon user reviews and has drawn many glowing comments. 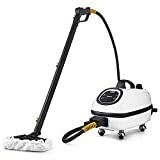 This capable steam cleaner is clearly one of the very best and impresses its owners with its quality, ease of use, and advanced low-moisture operation. Although this premium steamer offers industrial-grade performance and features, reviewers often mentioned the high price alongside with its many excellent qualities. That said, very few consumer models have the capacity to generate 90 minutes or so of forceful ‘dry-vapor’ in any one session. Its unmatched ability to safely freshen laminate floors and upholstery along with outstanding quality is worth the big upfront cost to serious homeowners. With the Dupray Tosca Steam Cleaner, you can make the most of its low-moisture output on fabrics and wooden furniture, but it is also great for regular steaming tasks such as refreshing tiled areas and glass. Easy-to-use pressure controls will let you adjust the flow to suit various conditions. The extra-large boiler volume and lengthy hose and power cord work well together for reaching and covering broad areas. The combination of forceful steam action and helpful attachments will let you tackle the worst kitchen and bath stains. The real benefit of this model over less costly alternatives is both the quality and quantity of steam it produces as well as its very durable build quality. The generous warranty only adds to its sterling reputation as one of the few good dry-steam models available.